SEATTLE (AP) — In a story Sept. 11 about a proposed fee on carbon pollution, The Associated Press reported erroneously that Shell pledged money to the initiative. Shell pledged money to oppose the initiative. SEATTLE (AP) — Voters in Washington state will be asked this fall to do what state and federal leaders have been reluctant to: charge a direct fee on carbon pollution to fight climate change. If the ballot measure passes, it will be the first direct fee or tax charged on carbon emissions in the U.S. Experts say it will prove states can take action even if the Trump administration doesn't, and nudge other states to follow. Initiative 1631 would charge industrial emitters that use or sell fossil fuels in the state for every metric ton of carbon emissions. The fee starts in 2020 at $15 per metric ton and increases $2 a year. It stops in 2035 if the state meets its goals to reduce greenhouse gas emissions. About 100 emitters such as oil refineries, natural gas power plants and fuel distributors would pay the fee, raising roughly $1 billion in the first year. The oil industry is bankrolling the campaign to defeat it. Five oil companies — BP, Phillips 66, Chevron, Andeavor and U.S. Oil & Refining — have given the bulk of more than $11 million in cash raised by a committee sponsored by the Western States Petroleum Association. Shell pledged money early on to oppose the initiative it has called "flawed," but said it won't participate in the ongoing campaign to defeat it. Initiative sponsors represent a broad coalition of social justice, labor, tribal and environmental groups who have spent several years hammering out the details. Many opposed the carbon tax initiative voters rejected in 2016, partly because it didn't do enough to invest in renewable energy or aid low-income and minority communities most impacted by pollution. If passed, money raised by the fee will pay for projects aimed at cutting pollution and protecting the environment, from solar power and zero-emissions vehicles to projects that store carbon and improve forest health. Proponents say polluters who release carbon emissions responsible for global warming should pay to address its impacts. Washington is seeing rising sea levels, more intense and frequent wildfires and floods and shrinking glaciers. The science "tells us that climate change is real, we're causing it, it's happening now and it will get worse," said Mike Stevens, Washington director of The Nature Conservancy, the top donor with $1 million in support of I-1631. The campaign in support has raised about $4.3 million in cash. Opponents say the burden will fall to consumers in higher energy costs. The fee would add an estimated 14 cents per gallon of gasoline in the first year. Initiative backers say each person would pay $10 a month more, an amount Gov. Jay Inslee recently said was worth paying for clean air. Critics say it will put companies at a competitive disadvantage, expand government programs and special-interest spending without proof they will reduce emissions and provide too many exemptions to be effective. "If you exempt the largest polluters, how can you say you're going after them? You're not," said Dana Bieber, spokeswoman of the No on 1631 campaign. The state's only coal-fired power plant, the single largest source of emissions, is exempted from the fee. Initiative backers say the TransAlta plant in Centralia is already under a legal agreement to stop burning coal by 2025. There are also carve-outs for pulp and paper mills, aluminum smelters, aviation and marine fuels and energy-intensive industries such as steel and aluminum plants. Nick Abraham, spokesman for the Yes on 1631 campaign, said people want to see money going to solving the problem of climate change. 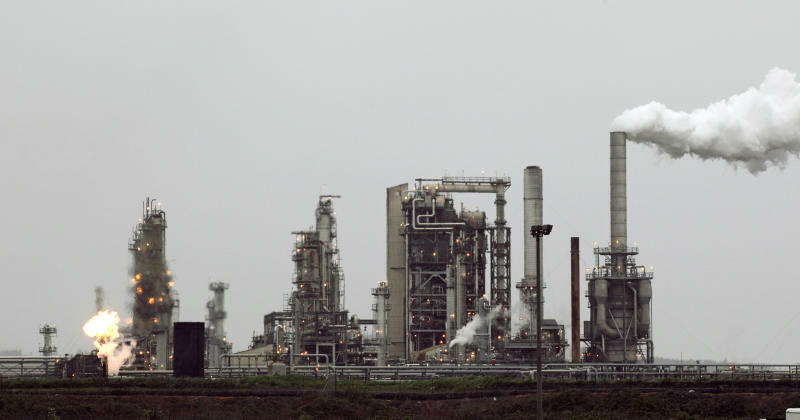 The initiative calls for 35 percent of revenues to be spent in the most polluted census tracts, setting aside money to help workers in the fossil fuel industry transition to new jobs and requires 10 percent to be spent on projects approved by American Indian tribes. Carbon legislation has eluded the state despite many attempts. 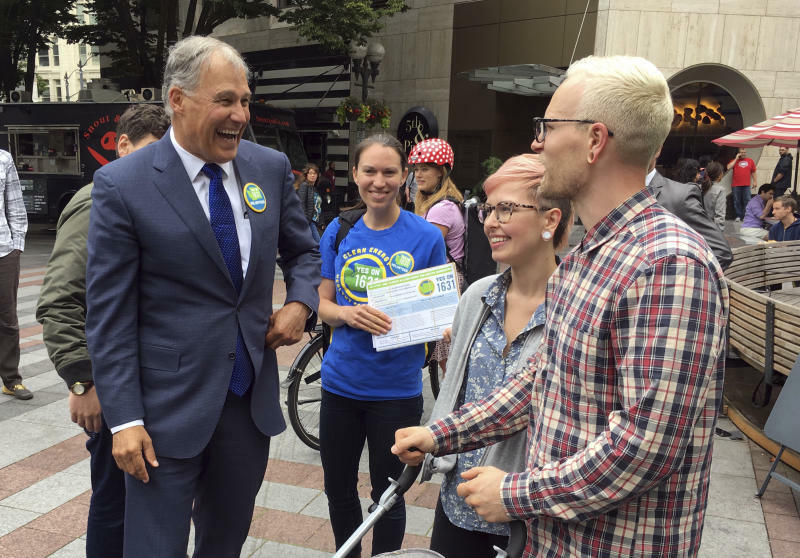 In March, the latest carbon tax proposal by Inslee, a Democrat, failed to win approval even though Democrats enjoyed a narrow legislative majority. "This is a really hard thing to do in any political context," said Barry Rabe, a professor in the Gerald Ford School of Public Policy at the University of Michigan. He said it's unprecedented to see a ballot effort twice in two years. The question will be "can you repackage something that has struggled in Washington and actually put it over with public support?" California passed a cap-and-trade program in 2006 that limits emissions and allows polluters to buy and trade pollution credits. A coalition of Northeast states also has a cap-and-trade program that applies to power plants. Fawn Sharp, president of the Quinault Nation, whose tribe has been working to relocate its entire village on the Washington coast because of the rising sea level and tsunami threat, said it's time for citizens to have a direct voice. "Elected officials know we're in a crisis and there still seems to be a lack of the moral and political courage to make the necessary public policy decision to save and protect our resources, to save our planet and our health and safety," Sharp said.